Migration, in all its various forms, has become more visible in sociology, cultural and postcolonial studies with a focus on the transformative impacts migration has on contemporary society.With the rise of global issues around identity, postcolonialism and memory during the late 1980-90s, terminology like ‘multiculturalism’ became firmly embedded in Australian cultural discourses. In response to these global issues, there has been an increased focus on including themes of migration into institutional collections and exhibitions that have taken place over the last thirty years.In Australia, the subject of migration has traditionally been presented in the form of large-scale surveys that focus on the migration experience through object-based displays. An attempt to build a cohesive narrative of the immigrant nation, personal objects, preserved and cared for by families and communities were incorporated into exhibitions designed to present definitive ‘migrant histories’.In this way, the spectacle of migratory experiences has been extensively referenced in a wide range of wall-text-object-based curatorial contexts within major institutions, but recently there has been a shift to move the theme of migration out of a static place and into a set of more intersectional relationships. Major cultural institutions like museums and art galleries are defined as spaces that generate narratives, events, and experiences, which in turn give rise to new cultural memories and other ways of remembering history.However, in Australia, cultural institutions are still adhering to the Eurocentric model that presents ‘us/them’ or ‘here/there’ peripheries, creating opposition between ‘settled inhabitants’ and ‘newcomers’ — characteristics predominantly found in dominant white narratives of culture and society.This sentiment is reiterated in Jill Bennett’s essayon migratory aesthetics where she comments on how the institutional model of ‘multiculturalism’ simply promotes the presentation of diverse identities as ‘add-ons’ to mainstream culture, therefore, ‘migrant art’ exhibitions may exist within the institution in relative separation and restriction.By being programmed in this temporary (or spectacular) way eg. MCA Art Bar,these artists are being implicated as disparate, or less than the selected mainstream program. As it stands, it has become a rather common practice for large mainstream institutions to fall short on providing audiences with consistently diverse programming that accurately reflects the migratory environment we live in today. The 2016 Census showed that Australia has a higher proportion of overseas-born people (26 percent) compared to the USA or the UK. As per 2016, people born overseas, or who have at least one parent born overseas, make up almost half (49 percent) of the entire population.New forms of intercultural exchanges and critical self-evaluation remain very much needed in mainstream institutions of art and history in Australia. The establishment of specialised museums and community-based gallerieshave been able to circumvent the overly stressed ‘nation of immigrants’ narrative that cultural institutions emphasise as a means by which to address inclusivity in their programming. These particular galleries or museums fill a void left by mainstream institutions by providing certain migratory groups with a sense of ownership of their own regionalised knowledge.These specialised museums and community galleries do provide safe spaces for certain cultural groups to reflect on settlement history and diversity from their own point of views, however, the positives notwithstanding, they can also reinforce barriers and distance between communities, audiences can be limited, and the focus on storytelling can often be unreflective and sensationalised.It’s important to note that while these spaces exist out of necessity, their formation is as a direct result of the peripheries the arts ecology finds itself in. More and more contemporary artists with migratory backgrounds based in Australia are using their own experiences to engage in intercultural and transnational exchanges within their practices, using contemporary mediums such as photography, digital media and performance to produce emotive art works. These particular mediums are proven to be effective in documenting the transformations of societies and spaces by migrant subjects and the subsequent transformation of the resident subjects during these encounters.This particular arena of art making drawn from personal experiences can be invaluable, both in terms of the communication and reflection of questions raised, and the emotions experienced around migration. Based in Brisbane, Sancintya Mohini Simpson unpacks her Indian-Anglo heritage and the complexities of migratory experiences within Australia through a variety of mediums. By intentionally fusing traditional and digital platforms her practice explores how, along with culture and tradition, memories and trauma are also passed down to the next generation. Often drawing from real experiences of family and friends, she inserts these familiar figures within her work as a means by which to critique real-life prejudices induced by otherness. 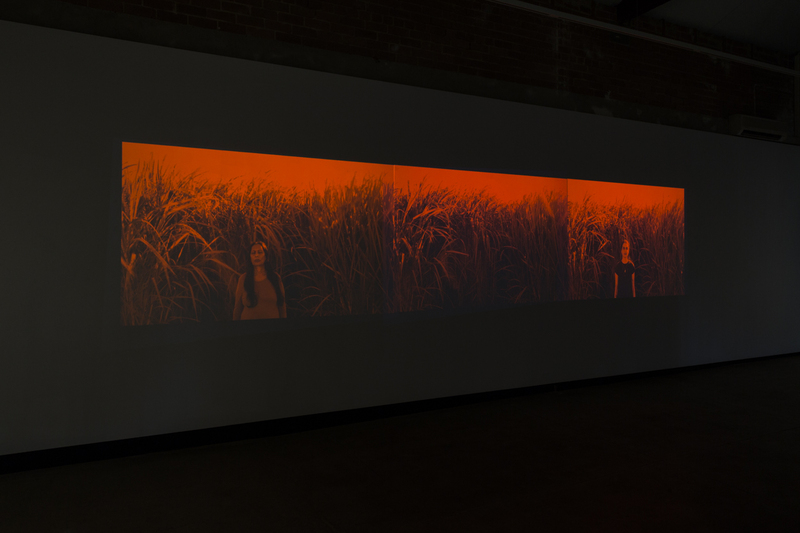 Bloodlines (2018) stands as a visual metaphor for the relationship between the artist and her mother through their matrilineal link. In this particular project, Simpson seeks to uncover the hidden matrilineal histories of those subjected to indentured labour and to afford them a rightful place in history. Perth artist Elham Eshraghian specialises in film and video installations. Her Australian Iranian-Bahá’í upbringing provides context as she highlights cultural identity and loss. Bohrân(2017) is part documentary, part visual poetry, and explores the story of Eshraghian’s own mother’s escape from Iran as a result of the 1979 Revolution. In cinematic scale the choreographed narrative, pixelated archival, and found footage communicate the relationship between the embodied personal experience of her family and the collective historical memory of the Iranian diaspora. Sheinvites the viewer to generate a sense of empathetic understanding of people engulfed in turbulence across the globe. Eshraghian, through her practice, aims to reveal the importance of providing a platform to the diverse and alternative voices of the displaced, while also moving toward a collective unity. In combining personal narrative with shared perspectives of migratory experience, she ushers a gentle reminder that these themes surrounding cultural identity affect many others around the world, not just in Australia. Simpson and Eshraghian are just two examples of an expansive number of Australian artists interested in migration, exploring their own stories of displacement, while others are using it as a political space to comment on and engage with contemporary debates.With this vast pool of artistic practices that are directly responding to almost 50 percent of our cultural population, how is it that migration and/or migratory experiences are still being presented as add-on programming for mainstream cultural institutions? Previous iterations of the migratory experience discourse within the arts ecology placed a specific emphasis on identity and belonging, however, other aspects of everyday life, mobility, multi-temporality, memory and the politics of affect, can all be aesthetically explored in migration.The move away from an almost ethnographic interpretation of migration and into more intersectional themes in artistic practices also needs to be included in institutional contexts (in a permanent manner) if they truly are spaces that intend on giving rise to new cultural memories and other ways of remembering history. Exhibitions about migratory experiences should be far more than just historical artefacts and anecdotes, but a way to negotiate these intersectional identities and notions of belonging on a local and global scale. There have been considered attempts to provide platforms for these exchanges to occur, but again, only on a large, performative scale. Launched in Melbourne in 2017, the inaugural Asia TOPA (Triennial of Performing Art) is another spectacle by way of an arts festival. Held over four months in more than twenty cultural institutions across metro and regional Victoria, the festival was introducing the world of Asia-Pacific performance art to Melbourne audiences.I do not discredit the festival’s intention of injecting the contemporary art scene with much needed and revised interpretations of what is assumed Asian art – the festival’s goal to move away from traditional (and expected) modes of Asian performance art and to provide audiences with contemporary narratives is highly commendable. But for me, it raises the question: why does diverse or inclusive programming have to be on such a large specular stage? 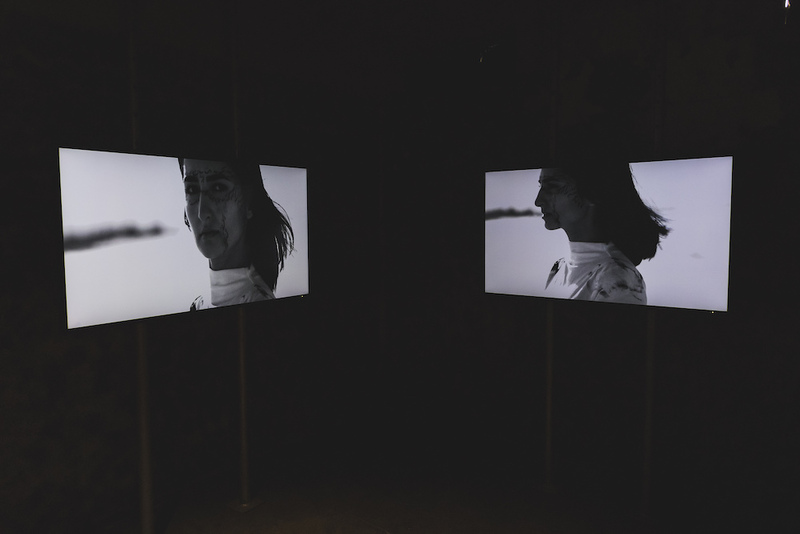 Independent curators, especially those from migratory backgrounds, have already been successfully producing intercultural curatorial projects that give a platform to artists responding to migratory themes outside of an institutional framework.Site of Passage (2018), curated by Tian Zhang and Claire Field at Customs House in Sydney, is the perfect example of this. The exhibition featured the works of nine artists who have ‘undertaken a personal voyage, ritual or action to assert themselves and their place within Australian culture’.As art writer Soo-Min Shim pinpoints in her review of Site of Passage; this exhibition and the works move away from migrant themes of grief or trauma — away from another spectacle — to consider migration outside of a recognisable or predictable story.There is something to be said about these smaller scale, thoroughly researched exhibitions that aim to work across cultural groups and in response to a thematic focus, that allows for a different, more sustainable, approach to storytelling.I truly believe that independent curators (especially non-white curators) can offer audiences more intimate and honest interpretations of migration, especially when presenting the politics of everyday life. Quite frankly, this is because they already are the embodiment of culturally and/or linguistically diverse life in Australia, and their understanding of these politics comes from firsthand experience. If curators and art institutions/organisations genuinely want to find a way to shift ‘migratory experience’ out of a static place, they must refrain from attempting to diversify art programming with an ‘add-on’ mentality. In the event a curator who has no cultural ties to a specific locale or region wants to organise a culturally diverse show, one that truly reflects the migratory environment we live in today, then a cultural advisor with a lived experience (sometimes more than one) should be employed from the inception of the project. Another suggestion for future exhibitions dealing with migratory themes is to be considered in the language chosen for exhibition statements, to avoid using blanket terms such as ‘trauma’ or ‘agency’ unless the works explicitly do respond to these themes. By taking language into consideration, exhibitions can avoid the kind of thematisation that overdetermines the context of works.I think by accommodating these considerations within exhibition making and institutional programming we can truly work towards demystifying the migrant experience in Australia and focus on conceiving more intimate, emotive and thoroughly researched exhibition concepts – moving beyond the spectacle of diversity that is at the forefront of inclusive programming today. In particular reference to forced and/or voluntary types of migration across the globe. Anne Ring Petersen and Moritz Schramm, “(Post-) Migration in the Age of Globalisation: New Challenges to Imagination and Representation” Journal of Aesthetics & Culture9, no. 2 (December 2017): 1. Eureka Henrich, “Museums, History and Migration in Australia,” History Compass 1, no. 10 (October 2013): 783. Jill Bennett, “Migratory Aesthetics: Art and Politics Beyond Identity,” in Art and Visibility in Migratory Culture: Conflict, Resistance and Agency, ed. Mieke Bal & Miguel Á. Hernández-Navarro (Amsterdam: Rodopi, 2011), 109. Alessandra De Angelis, “Introduction: Disruptive Encounters – Museums, Art and Postcoloniality,” in The Postcolonial Museum: The Arts of Memory and the Pressures of History, ed. Iain Chambers et al., (Farnham: Ashgate, 2014), 2. An example of such programming includes MCA Artbar curated by Get to Work in August 2018. Anne Ring Petersen, Migration into Art: Transcultural Identities and Art-making in a Globalised World(Manchester: Manchester University Press, 2017), 113. Examples of such organisations include Sydney Jewish Museum in Darlinghurst and HurstvilleCity Library Museum and Gallery, NSW. Maura Reilly, Curatorial Activism (London: Thames & Hudson, 2018), 224. Chiara O’Reilly and Nina Parish, ‘“Telling migrant stories in museums in Australia: Does the community gallery still have a role to play?” Museum Management and Curatorship30, no. 4 (July 2015): 306. Chiara O’Reilly and Nina Parish, “Suitcases, keys and handkerchiefs: how are objects being used to collect and tell migrant stores in Australian museums?” Museums & Social Issues12, no. 2 (October 2017): 109. Elham Eshraghian, email correspondence to author, September 17, 2018. O’Reilly and Parish, “Suitcases”, 110. Mieke Bal, “Migratory Aesthetics: Double Movement”,2008. O’Reilly & Parish, “Migrant Stories”, 307.